Member Discount Code available. Sign In or Become a Member. SS Jeremiah O'Brien & The SF Maritime Park Association. Join any of these organizations today to get your free tickets. Get your tickets online, either in advance or on the day of the Crawl. For smartphones, use this map. You can start your crawl at any of the Attractions below; map your own route for the event and spend as much time at each location as you'd like. We encourage you to walk, bicycle or use public transport for Mechanicrawl; maps, featured tours and demonstrations and additional info are listed below in Map Your Crawl. When was the last time you rode a cable car? 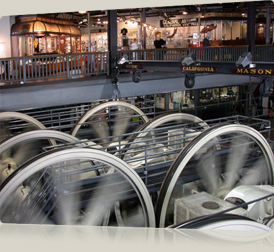 Hop on the Powell/ Hyde line and then hop off at Mason and Washington to step inside the Cable Car barn where you can see the engines and enormous wheels that power our city’s most mechanical mode of public transportation. Each leg of the ride is a new fare - so buy a day pass if you plan to use the cable car for Mechanicrawl. 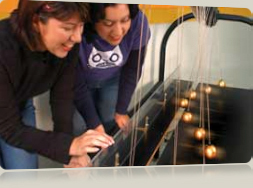 Visit the Exploratorium's famed interactive exhibits on science, art and human perception. Ask an Explainer to show you the inner workings of their exhibits. 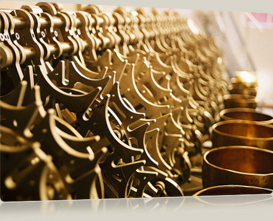 Marvel at the ingenious devices their shop creates for your amusement and edification! Explore Fort Mason’s latest art installation SEAT; 35 site specific seats tucked all over the campus which reflect on its particular history and spectacular location. Use the map and cell phone tour to dig deeper. An eight foot high mechanical Orrery, a circular Pendulum, the Equation of Time Cam, a sphere of solid Tungsten, a microetched language archive and more... All of these exhibits are part of the Long Now's project to build a Clock to last for 10,000 years. Meet some of our Clock team who’ll be demonstrating the prototypes. Play with turn-of-the-century automata including SF’s own "Laffing Sal", mechanically operated musical instruments, a rare steam powered motorcycle, classic video games and another 200 coin operated curiosities - bring lots of quarters! Second generation curator Dan Zelinsky will be giving demos, tours and anecdotes of this amazing collection. 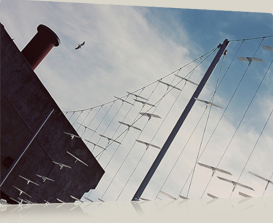 Investigate the subtle phenomena of the everyday world through 23 outdoor exhibits at Fort Mason, which offers a unique location for observing the movement of wind and waves, the interplay of light, shadow, and temperature, and the interaction between natural and built environments. Download the map & MP3 audio tour! Working exhibits of block and tackle, capstans for loading and unloading, a giant Fresnel lens and more boat lore and mechanical ingenuity await you at this waterfront park. Historic ships are docked alongside the Hyde Street Pier with a backdrop of spectacular views of Alcatraz and the Golden Gate Bridge. Listen to the cell phone audio tour! There are few places on earth where you can be inside a giant running steam engine. 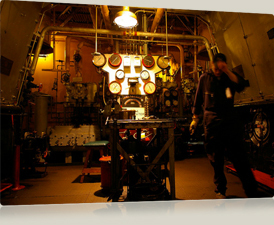 This massive engine room of one of the last 2 remaining WWII Liberty Ships, many of which were made here in the Bay Area, was used as the engine room set for the movie Titanic. The O'Brien's engine room puts the steam back in steampunk and the engines will be running for Mechanicrawl! 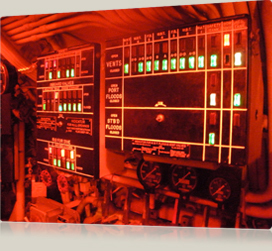 Experience the close quarters of a real WWII diesel sub packed with amazing gear like the Electronic Cipher Machine, the Periscopes, Hydraulic Systems and the Navigation Systems. The star of the sub is its Torpedo Data Computer, one of the most complex electro-mechanical computers ever put into service. Download the MP3 audio tour! Hear the surreal sound-scape of this wave-activated acoustic sculpture located on the long curving jetty next to the Marina Green. Perch amid the detritus of a demolished cemetery and listen for the subtle sounds made by the 25 “organ pipes” which are most active at high tide. On 9/24/11 high tide is at 10:19am and the lowest tide is at 3:40pm. The Mechanicrawl route can be walked by almost the exact same path as it can be biked. The key difference is that there is a staircase connecting Upper Fort Mason to Fort Mason Center. For detailed walking and bike maps with the grade of the streets, visit the San Francisco Bicycle Coalition's website. Another option is to walk part of the way and take the bus out to the Exploratorium, see the "Public" tab for more details on bus routes. In the spirit of this mechanical celebration, bicycling is highly encouraged! For detailed bike maps with the grade of the streets, visit the San Francisco Bicycle Coalition's website. Public Bike Parking is available at all of the Attractions; note that there will not be a Bike Coalition valet service at Pier 45. There is ample bike parking at the Exploratorium and at Fort Mason Center. Bay City Bike Rentals is offering Mechanicrawl participants $7.00 OFF bike rentals! Show your Mechanicrawl ticket at one of their 3 bike shops on 9/24; 1325 Columbus Avenue @Beach, 2661 Taylor Street @Beach or 501 Bay Street @Taylor. One of the benefits of bicycling this event is that wherever you decide to start, you'll be able to stay along the water enjoying views of the bay for almost the entire ride. This map only shows bus routes that are relevant to Mechanicrawl; see 511.org for help scheduling your complete trip or Nextbus to easily check when the next bus or transit vehicle is arriving. 28 - This line will take you between The Exploratorium (get on or off at Francisco) and Fort Mason Center (The line terminates across from the Fort Mason Center Gate on Marina). 30 - This line will take you from Downtown to the S.F. Maritime Park (get on or off at Hyde) and over to The Exploratorium (get on or off at Jefferson). 47 - This line will take you from anywhere along Van Ness Ave. to the S.F. Maritime Park (get on or off at Hyde) and the Fisherman's Wharf area (get on or off at Taylor). 10 - This line will take you from Downtown and along the Embarcadero to the Fisherman's Wharf area (get on or off at Taylor) and the S.F. Maritime Park (get on or off at Hyde). F - This line will take you from Market St. and along the Embarcadero to the Fisherman's Wharf area (get on or off at Taylor). You can take the Powell/Hyde line for a very mechanical trip across the city! Each leg of the ride is a new fare - so buy a day pass if you plan to use the cable car for Mechanicrawl. Parking at the Exploratorium is free, but limited; here are directions and parking info. Parking at Fort Mason ranges from $1 to 10; here are directions and parking info. Parking in the Fisherman’s Wharf area can cost around $30 a day; here is info on the parking garages. Here is the schedule of the tours and demos at all the Mechanicrawl Attractions. Cable Car Museum - Real Cables Pulling Real Cable Cars The museum deck overlooks the huge engines and winding wheels that pull the cables for the cars. Downstairs is a viewing area of the large sheaves and cable line entering the building through the channel under the street. Exploratorium - Self Guided Floor Walks Check out the Self Guided Floor Walks, like the Geek Walk, for a new twist to your visit. 12:00 to 2:00 - The Arup Team who created the SEAT installation will be on hand to talk about the project and give guided tours. Meet at the Arup Team SEAT in front of the Herbst Pavilion anytime between 12 and 2. You can also use the map and cell phone tourto dig deeper. 11:00 to 12:00 - Clock Team member Paolo Salvagione giving demos. 12:00 to 1:00 - Clock Team member Greg Staples giving demos. 1:00 to 3:00 - Clock Team lead Alexander Rose giving demos. The Clock Prototypes will be on display throughout the day. 1:00 and 3:00 Guided Tours of the Outdoor Exploratorium Installation with Maz Kattuah, meet outside Long Now. You can also download the map and MP3 audio tour. 11:00 to 3:00 - Donkey Steam Engine Boiler Restoration; with park Steam Specialist Eric Olson. At the engine, located at the entrance gate to the pier. 11:00 to 11:30 - Hicks Engine Demonstration; aboard the small craft "The Wetton" on the floating dock at the end of Hyde Street Pier. 1:00 - Observe the crew of the 1891 scow schooner Alma set sail in the water off the far end of Hyde Street Pier. 1:00 to 1:45 - Balclutha Tour. A guided tour of the 1886 square-rigged sailing ship. Meet on the main deck near the gangway portal. 2:15 to 3:00 - Balclutha Tour. A guided tour of the 1886 square-rigged sailing ship. Meet on the main deck near the gangway portal. 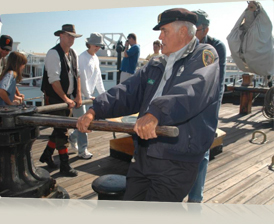 2:30 to 3:00 - Hicks Engine Demonstration; aboard the small craft "The Wetton" on the floating dock at the end of Hyde Street Pier. 3:00 to 3:45 - Balclutha Tour. A guided tour of the 1886 square-rigged sailing ship. Meet on the main deck near the gangway portal. 3:45 - Observe the 1891 scow schooner Alma returning to Hyde Street Pier after a scheduled sail. You can also listen to the cell phone audio tour. Giant Fresnel lens from the Farallon Islands in the Visitor’s Center at 2905 Hyde Street. Model ships, maps & Art Deco sea life murals at the Museum at 900 Beach Street. SS Jeremiah O’Brien - Giant Running Steam EngineStep inside the giant running steam engines of the SS Jeremiah O’Brien; an amazing experience! Engines will run all day, last entry at 5pm. Be sure to check out the rest of the ship and the diorama of the Battle of D-Day. 11:00, 12:00 and 1:00 - The Torpedo Data Computer is the most sophisticated mechanical computer made; demos given by expert CJ Wierzbowski. Meet at the sub propeller display on the dock. The Pampanito’s Ham Radio Club will be transmitting live from the Radio room inside the sub, stop by on your tour and say something on the airwaves or listen on their call sign NJ6VT. You can tour the Pampanito submarine throughout the day; download the MP3 audio tour here. 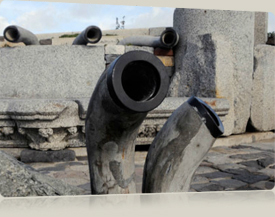 Wave Organ - Wave Activated Acoustic SculptureHear the surreal sound-scape of this wave-activated acoustic sculpture best at high tide; on 9/24 high tide is at 10:19am & dips to a low at 3:40pm. Keep your printed ticket with you - it is your pass to all locations! 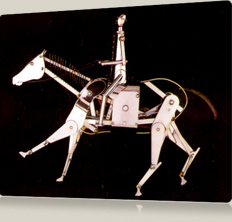 Tickets can be purchased online all day of Mechanicrawl; you can also purchase tickets on 9/24/11 at The Long Now Museum. Follow us on Twitter for event updates, info on demos and behind the scenes peeks of Mechanicrawl. Picnic supplies are available at Trader Joe’s, Safeway and Golden Gate Deli & Liquor. Chaac Mool, Greens to Go and Reader’s Cafe all offer food and drinks at Fort Mason Center. 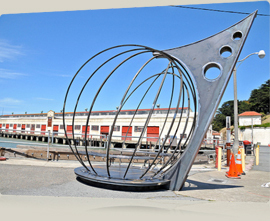 Public Restrooms are located at the Hyde Street Pier, Ghirardelli Square, Marina Green Park, Upper and Lower Fort Mason Center and the Exploratorium. Discount Bike Rentals - Bay City Bike Rentals and Tours is happy to offer Mechanicrawl participants $7.00 OFF 24 Hour bike rentals! Simply show your Mechanicrawl ticket at one of their three bike shops September 24th and save instantly. Please note, there is no handicapped accessibility to the USS Pampanito and the SS Jeremiah O’Brien as they are historic vessels. We’ll do our best to accommodate people at all of the other Attractions. AnimalPalooza - a kid- friendly, up-close, hands-on encounters with animals from around the world takes place at Fort Mason on 9/24 from 11-5. Separate tickets must be purchased for this event. SF Public Library’s Big Book Sale will be going on in the Festival Pavilion from 10-8 on 9/24; admission is free.